From asphalt shingles to wood shakes to clay tiles, here are the many options available for the topside of your home. For most of us the roof is an afterthought—at least until it starts to leak. Then we realize how critical that surface of our house's exterior really is. Yet, as well as keeping the house dry, the roof contributes greatly to the look of the house, so when building a new house, adding on, or re-roofing, it may pay to consider the options. Right now there are more options in the marketplace than ever, so choosing one is tough. I know because I am in the midst of selecting a roof for my cabin in Maine, and every time I know what I want I look at one of the other options and begin to change my mind! The choices range from asphalt shingles to wood shakes and clay tiles, from steel panels to rubber lookalike slate. The most important trend to note, however, is that as with home-construction materials in general, there is an increasing move towards engineered roofing materials. This change is being driven by a few different factors. One is simply the high cost of wood. The second is that in many cases, codes now mandate the use of fireproof construction materials. And third, people understandably want to build with materials that not only look good but also are very long-lived. The roofing material we all see the most of these days—the one that covers the roofs of a great majority of houses across America—is the standard three-tab asphalt shingle. One of the least-expensive roofing options, asphalt shingles are available in a dozen or so different colors both solid and blended. The shingle products being made today are usually guaranteed for 20, or in some cases 30 years, making them an excellent value. Value is the principal advantage of this roofing material, which explains it's commonality. The disadvantage, however, if there could be said to be one, is the fact that it is so common. The next upgrade from a standard three-tab is a thicker variation called an architectural shingle. 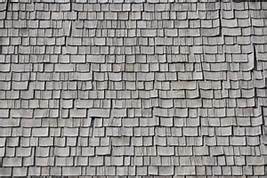 These shingles are built up to be about twice as thick as a normal shingle with the layers staggered to give them a heavier, more substantial or "architectural" look. In some colors they resemble slate, and in other colors wood shakes. We used architectural shingles on the Lexington ranch house. With only a modest upgrade in cost and up to a 30-year guarantee, architectural shingles also represent an excellent value with an added touch of style. For looks, it is hard to beat a wood shingle roof. Over time it weathers out to a gray or soft silver that seems to root the house to the landscape. Several species are used: Western Red Cedar, Alaskan Yellow Cedar and Eastern White Cedar. Shingles are relatively smooth and cut to a uniform thickness, although they vary in width. Wood shakes are thicker and rougher, being split rather than sawn from the logs. Wood roofs are meant to breathe and should be laid over a substrate that allows air to circulate behind them: skip sheathing—wood strips or battens nailed directly to the roof rafters—is the traditional method of installing a wood shingle roof. About 10 years ago we began using a plastic matrix product that is something like a scrubby pad, which allows air to circulate behind the shingles. This product can be laid on top of a building-paper-coated plywood roof deck, making it ideal for a retrofit. Another method of getting air circulation behind the shingles is to lay them on pressure-treated lattice. For all their great looks, shingles and shakes are expensive to install and do require some periodic maintenance, typically in the form of washing to remove any mildew or moss, and then re-oiling with a clear wood finishing product. On our current Shingle-style project here in Manchester, Massachusetts, we're using a wood shingle that is new to us: pressure-treated Southern Yellow Pine, which grays out in a few years to resemble cedar and is said to require no maintenance at all. A properly installed and maintained wood roof should last at least 30 to 50 years. In fact, we have seen roofs on which the shingles were still good after 25 years or so, but the galvanized nails were finally rusting, so be sure to use a high-quality stainless-steel nail!